I saw a squirrel outside of the library on Monday. I looked at the squirrel, and he looked at me, and we shared a moment. In my everlasting need to anthropomorphize any animal I come in contact with, I wondered if he lives by the library because he wants to learn how to read. He might sit in the windows and look in at all the books, wondering if there is one in there that could teach him how to talk to humans. Or maybe he finds humans mostly unimportant. He did not seem to be too scared of me, even staying still long enough for me to pull out my camera. 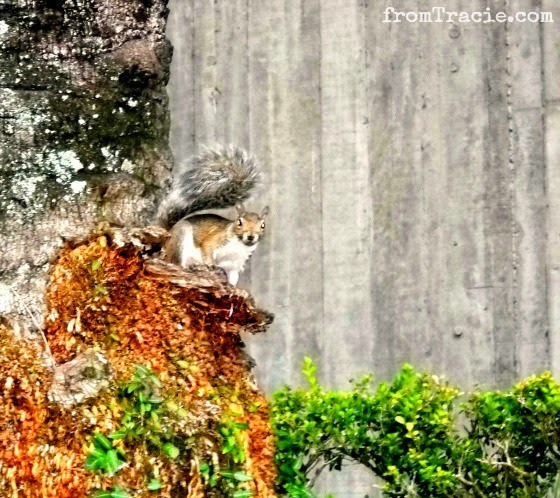 City squirrels have to get used to noise and people if they are ever going to come out of their trees. I feel a particular love for squirrels. It is probably due in part to all the Bob Ross I watched as a child, and even more to Poncho and Lefty, the two squirrels Thomas, Katarina and I raised. It was nice, even for just a minute, to connect with this library squirrel. I would be happy to sneak him into the library, if only he could promise me not to chew on the books. Books probably aren't very tasty to squirrels, so he'd probably be safe in the library. It would almost be worth it to see the librarians' expressions. It really would be worth it to see the librarian's expressions! I like squirrels too. I think they have a funny sense of humor. My dogs chase them constantly and they taunt them. Once one, after being chased up a tree, threw nuts down at the dog and I. That is hilarious! I wish you had a video of the squirrel "fighting back." They really do have a great sense of humor. They can be very fun to watch, and photograph! LOL! My youngest was so excited to see an albino squirrel at the farm on Tuesday. I always wonder what animals are thinking about us. Mostly, they probably think, "idiots." Albino squirrels are extra awesome. I really should have! But I think he was pretty happy in his library tree. That is the best snap shot. LOL! His show is great for jump starting an afternoon nap! I rescued a baby squirrel once. HIs mother was killed by my cat. I raised it and it bonded on me. I even took it to school. He stayed with me for two weeks and one day took off up a tree. I love squirrels too.